Tweet Scoop: A bizarre thing happened late in Ginebra's 100-96 win over San Miguel on Sunday. The Beermen were behind 95-98 with 24 seconds left in regulation but the Spiderman Arwind Santos missed 2 threepointers that could've tied the game. Fortunately for San Miguel, Chico Lanete was fouled and a shooting attempt. He had the chance to cut down Ginebra's lead down to a single point, but a strange thing happened. Standing beyond the arc was Chris Ross. Referee Noy Guevarra offered him the ball. 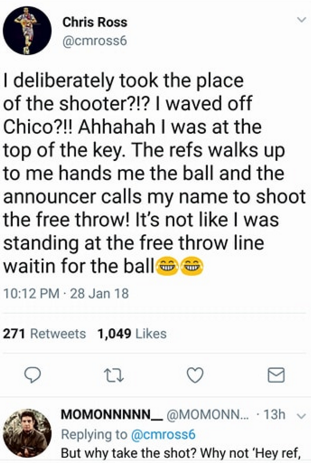 Ross on the other hand obliged to shoot the free throw instead of the fouled baller Chico. Chris missed the free throw and then he was called for a technical foul for delaying the game. The ever relibale Tenorio sank the technical shot to extend Ginebra's lead to 2 possessions. That proved to be enough to pressure SMB en route to a big win that arrested their losing skid. You be the judge, what's your opinion on the call?